(ASL) Sign Language Classes & Tutors Near Me (Westphalia, MI) — Buy Lessons Now. ve the gift of playing music, understanding music, and living musically. I have learned and played music since I was 8 years old. This class can be done various ways. 1) I can tutor you for a ASL class you are currently taking. 2) I can help you keep fresh on ASL you already know (we can spend class practicing communication skills. 3) We can learn the basics (ABCs, Counting, Colors, and so on) Basically start from the beginning as an ASL 1 class and we can work our way toward understanding and communicating. I have students who are doing this for their career in order to communicate to deaf people they come to contact with in their professional life. For those students I base our classes around signs they would use in there place of work. Some occupations of my current students include: Nurse, Social Worker, Santa, US Military, Flight Attendant, and more. I also teach students who have zero ASL background and we start with the very basic signs and work our way to forming sentences and battling the ASL grammar. 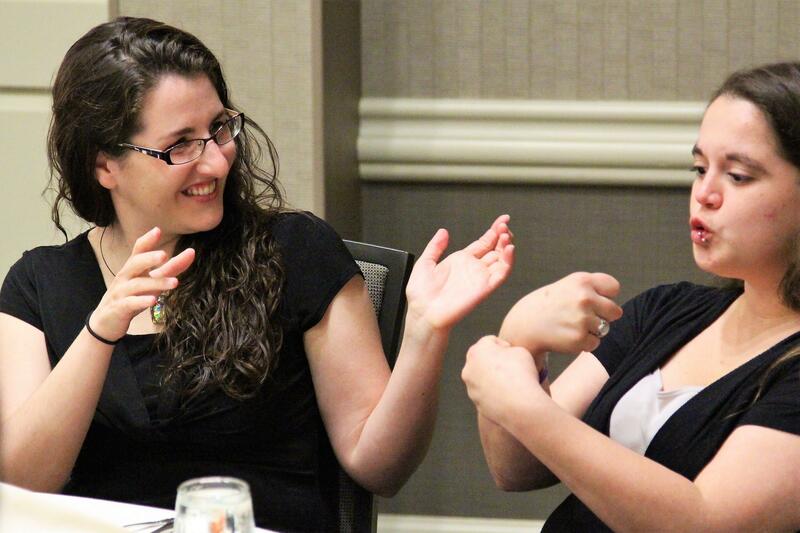 No matter where you are in your journey of sign language, this class will be perfect for you. If you are looking for a relaxed, fun and natural way of learning American Sign Language (ASL) let's try some lessons together. I teach in an interactive and empowering way where discovering the beauty of this visual language and the valuable culture cherished by Deaf and Hearing Americans is part of every lesson. I am a college professor, state certified educator, and an Interpreter. I love working with students and sharing what I know. It is such a joy watching students understanding and skills grow. I am thrilled and honored to be part of continuing the use of ASL and appreciation of Deaf Culture. I cater lessons to match your learning style and communication needs. Your classes will also have music, role-play, games and story telling. I introduce every new lesson with grammar concepts, vocabulary, and interactive practice. Then you will be able to use a DVD and workbook to rehearse and study on your own. I was interested in learning to sign from the time I was a little girl. American Sign Language and the Deaf culture have always been fascinating to me. When it was time to choose a college and career, I sought a way to use ASL in my daily life. I became a Teacher for the Deaf, and I continue to have a passion for both the language and the culture. I want to share that passion with you! I have been a Teacher for the Deaf for 5 years. I work daily with students who use ASL as their main form of communication. In addition to meeting their individual needs, I create goals and implement direct lessons to help them learn and improve ASL. I learned American Sign Language in a formal college setting. I learned ASL from both Deaf and hearing instructors. I met several times weekly with my professors in the classroom setting and participated in "immersion" hours throughout my college career. Now, I use it daily to communicate with my students and other professionals.